The lore from this game is immense and complicated as this 27 minute Youtube video reveals. It's not necessary to know all of the background to play Automata although I found myself drawn to learn more about the history. Nier:Automata is a beautiful and stylish game full of action and mystery. The fights themselves are wonderful to watch and are very dramatic. The character design really stand out as evident as the huge amount of cosplayers and fan art that surfaced this year. 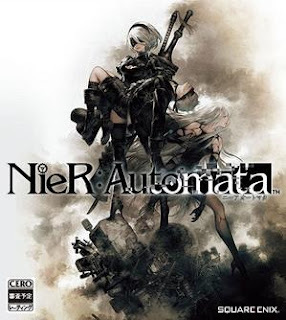 I wasn't following video games at the time Nier:Automata came out, but I saw pictures of 2B appearing everywhere which led me to look up with it was all about. By the time I got the game, I expected an action pack hack-n-slash action RPG and it didn't disappoint. I expected beautiful graphics and it didn't disappoint. What I didn't expect was the soundtrack and how wonderful it was. I haven't enjoyed a game soundtrack like this since FFX. It adds in a significant way to the magic of the world that visuals along can't do. The pacing of the game can go very quickly and I found myself getting to the end of the first run-through (this game have you go through the story 3 times each as a different character) slightly under-leveled as I was eager to see the story line progress. I was still able to complete the run-through and this style of gaming suits me well as I like to get through the game first and then go back and play it in more detail if I really enjoy the game. This isn't a game to play in front of kids. While most of the fighting will seem to just be the main character beating up robots protagonists there are some graphical scenes that is probably not appropriate for the little ones. It can also be said that if they are paying attention to the story and understand the context then the killing that is happening on screen are not so black-and-white as good vs evil. Character design and personality I'm sure there's plenty of fan-girls for 9S and fan-boys for 2B. Stylish combat and game play. The game is very cinematic. Exp grinding (but it's an RPG so what'd you expect?). The transport systems really helps navigating the world but during key parts of the game the place you need to get to can't be accessed. I'm loving Nier:Automata and would recommend adding to your PS4 gaming library.